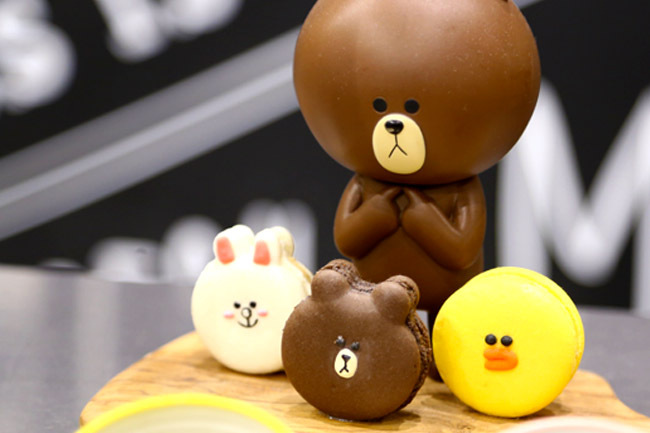 [Seoul] The Line Friends Store & Café located within Sinsa-dong, Gangnam-gu has become a MUST VISIT for Line fans. 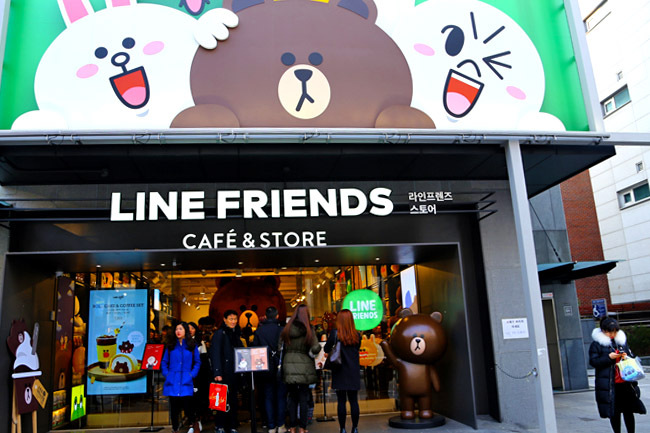 The Line Friends flagship store at Garosu-gil occupies 3 stories of a building, and is considered the largest amongst all the Line Friends stores around the world. Walking in, I suddenly felt like a kid again. I mean, I don’t even like Line characters THAT much, but ended up leaving with a plush toy. Opps. 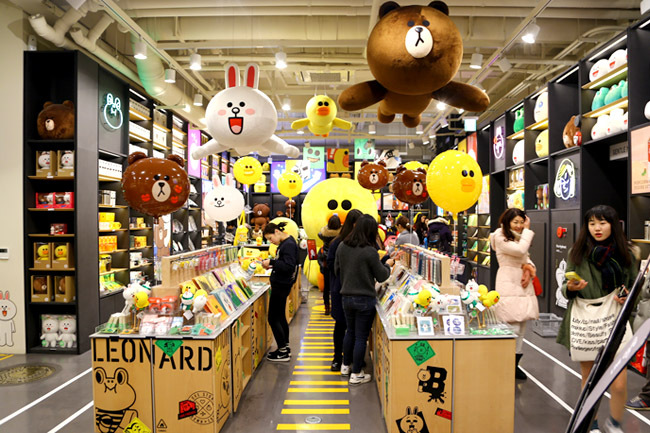 While the first storey contains mainly toys and accessories, the second floor features FRIENDS collaborations, with brands such as Be@rbrick, Swarovski, and Lamy (Yes, Brown Lamy pens) along with wearable items such as t-shirts, caps and sweatpants. By the way, there is always a short queue to take a photo with a 3.2 metre tall Brown at the entrance. While Sally at the basement, seemed quite lonely. 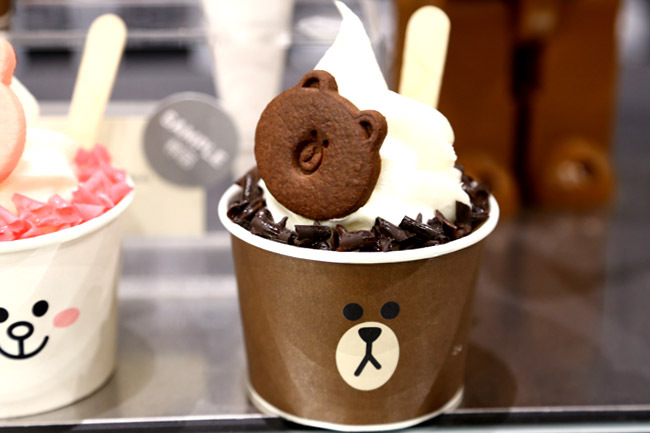 The basement level houses a character themed café with a 20-piece menu featuring Brown & Sally macarons, Brown lattes, and Cony cookies, many exclusive to this Garosu-gil store. 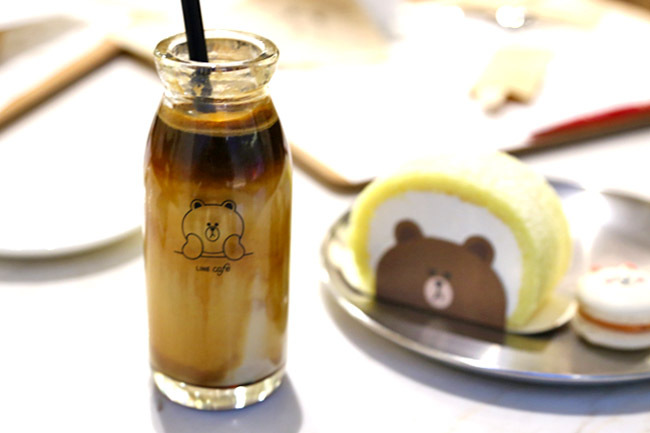 Beverages such as Caffe Latte, Cappuccino, Vanilla Latte, Caffe Mocha are available from 3,500 Won to 5,300 Won (SGD$4.20 to SGD$6.40) and the iced versions come in cute little glasses. 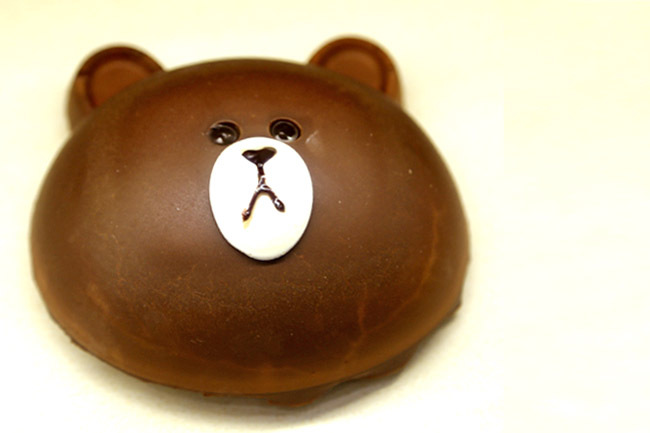 Many of the desserts such as Brown Choco Mousse Cake (15,900 Won), Choco Roll Cake (4,300 Won), White Cream Roll Cake (4,300 Won) and Macarons (3,000 Won) are sold out very quickly. 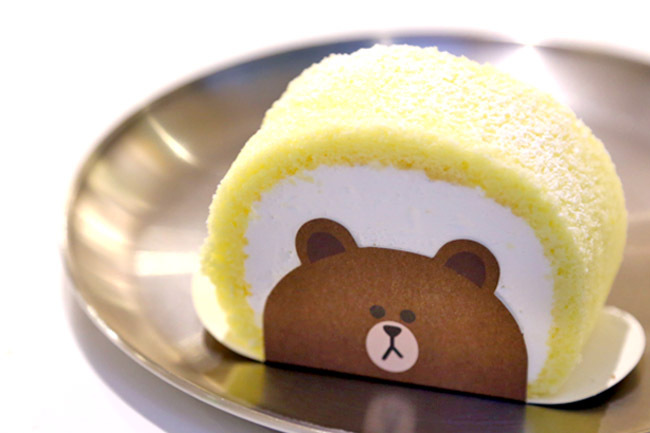 Was ‘fortunate’ to try out a roll cake – actually not too bad, though on the sweet side; and macaron which was regrettably overmuch dry. 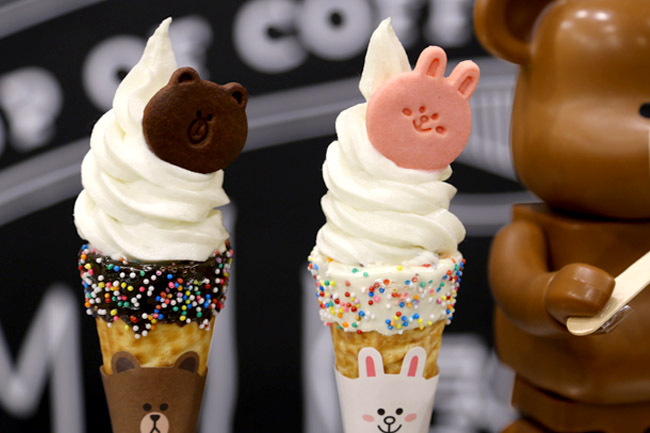 I think there is an understanding that people do not go to a cartoon based café expecting very delicious food. 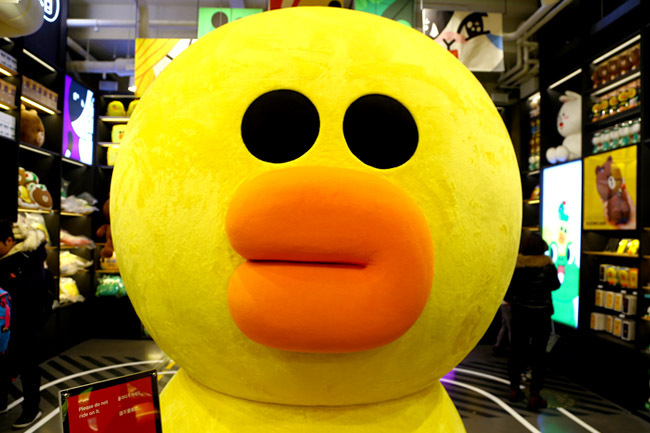 If you need to grab some Line merchandise, this is one of the best places to get. 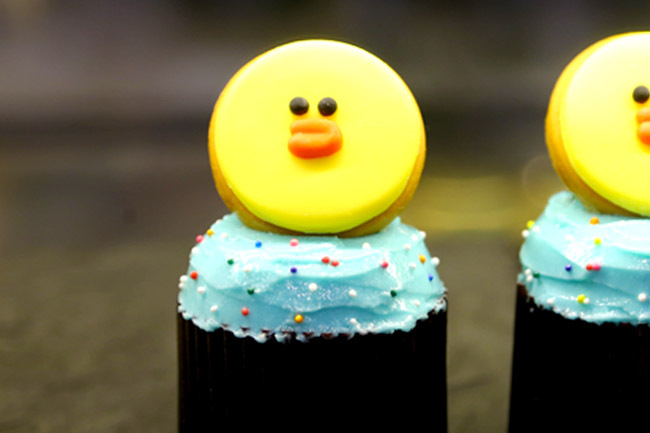 Warning: You may leave with more than you intended to.